1 Bedroom Flat For Sale in for Guide Price £275,000. This is a superb first floor apartment in a distinguished Grade I Listed Georgian townhouse approximately one mile level walk to the city centre. The principal drawing room benefits from tall corniced ceilings and three tall sash windows allowing light to flood in, all with a wonderful panoramic aspect to the rear and also benefitting from a balcony with wrought iron balustrade. The kitchen has been designed on one side with a low level division offering open plan living, but with the benefit of the perfect U-shape kitchen plan. Sleek contemporary units are fitted under wooden work surfaces, plus further eye level storage. There is room for a table by the open window allowing you to look out across the hills; a wonderful spot for dining. Further features include a central marble fireplace with a cast iron basket and wedding doors opening into the bedroom, also retaining a period sister marble fireplace plus stripped and polished floor boards that run through these principal rooms. This really is an elegant and smart first floor apartment with period features and views. Grosvenor Place is a handsome Georgian terrace on the east side of Bath. To the front is a wide grass verge lined with mature trees and a slip road with privacy from the London Road. Larkhall is situated on the other side and has a wonderful community atmosphere centred around the square. The popular amenities include a local theatre, schools, church, and a number of shops including butchers, grocers and delicatessen, plus a small supermarket. To the rear is access to meadows leading through wonderful countryside to the Kennet and Avon Canal and the River Avon. 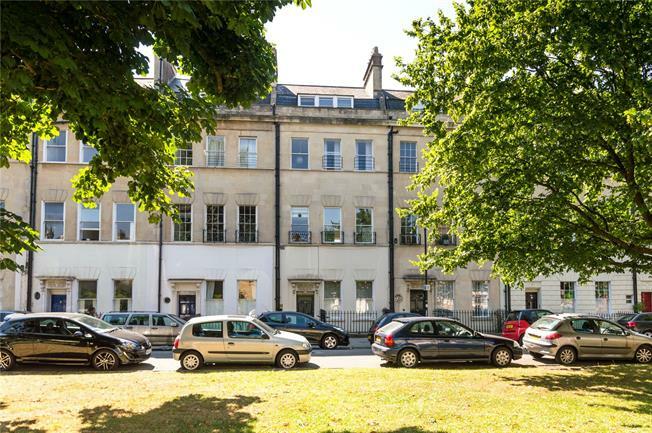 The city of Bath offers an array of cultural and leisure amenities and is a level walk of approximately one mile. The city is a unique blend of old and new offering breath-taking architecture with cosmopolitan lifestyle. Bath hosts some of the best shops, restaurants and leisure facilities outside of London. The Bath Spa Railway Station has a high speed train service operating to London Paddington (approximately 90 minutes). Junction 18 of the M4 is easily accessible from Grosvenor Place and is approximately 10 miles. Bristol International Airport is approximately 20 miles. Term of Lease: 999 year lease from 24.06.1976.